Stoke had midfielders Ibrahim Afellay and Charlie Adam sent off as West Brom secured a first league win this season. Afellay went for reacting to a challenge by Craig Gardner before Adam followed six minutes later after appearing to stamp on Craig Dawson. West Brom took the lead when club record £12m signing Salomon Rondon headed home Rickie Lambert's cross. 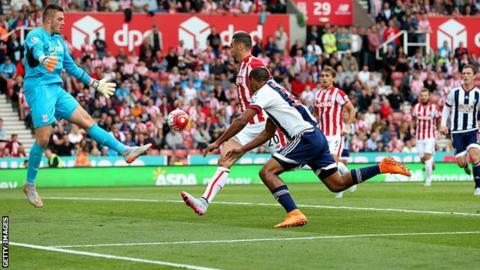 It was enough to earn Baggies boss Tony Pulis victory on his first return to his former club. Pulis was given a standing ovation by a sell-out crowd at Stoke, the club he took into the Premier League, and led to the 2011 FA Cup final and a place in the Europa League. But home fans were not so generous towards referee Michael Oliver as the hosts were left to play with nine men for more than an hour. Stoke started brightly and were on top when Afellay was shown a red card for slapping Gardner in the 25th minute. A great cross from the right by Rickie Lambert unlocked Stoke's defence as Salomon Rondon headed home. The West Brom player had clearly fouled his opponent, and appeared to flick a hand at Afellay as the latter sat on the ground, but Oliver had no hesitation dismissing Afellay. Gardner was booked for his contribution. It went from bad to worse for the hosts, Adam sent off after the referee consulted his assistant following a challenge involving Dawson. Television replays showed Adam's foot made contact with Dawson's knee when the West Brom player was on the ground. There was much to admire about Stoke after they were reduced to nine men. They made West Brom work hard for their three points but Mark Hughes's side remain without a win this season and will be without two key players for their next game at Arsenal. Midfielder Xherdan Shaqiri, the Potters' star summer signing, showed his quality in spells but, whatever their feelings about the refereeing decisions, Stoke's uncertain start to the season continues. Stoke City manager Mark Hughes: "I'm delighted with the performance of my team under difficult circumstances. "The first red card, Ibrahim Affelay reacted to being flicked in the face. By the letter of the law, maybe they both should have been sent off. "With the second one, Charlie Adam ends up standing on the lad's leg after the other player had followed through on him. I think it was harsh." West Brom manager Tony Pulis: "We moved the ball too slowly when they went down to nine men. "We tried to open it up a bit by bringing on Rickie Lambert and Callum McManaman. "To play Manchester City and Chelsea in our first two home games, it's been a tough start. For us to be sat with four points from four games is not bad. We're happy with that." This is the 10th time that a side have been reduced to nine men in the Premier League before half-time. The last team to have two men sent off in the first half of a Premier League game before today was also Stoke (v Newcastle on 26 December 2013). Solomon Rondon scored his first Premier League goal for West Bromwich Albion with his seventh shot. After a tough start against Chelsea and Manchester City, West Brom's season is up and running. Pulis's team will return from the international break with some winnable fixtures, Southampton the visitors on 12 September. But will striker Saido Berahino, left out of the this game amid speculation linking him with a move away, still be at the club? Two points from four games is not the start Stoke were looking for and it does not get any easier for the Potters. Their next game is at Arsenal on 12 September. Former Wales striker John Hartson on Afellay's red card on Final Score: "There's nothing in it. Afellay taps him in the face. You can't raise your hands, but come on, it's so soft." Second Half ends, Stoke City 0, West Bromwich Albion 1. Attempt missed. Marko Arnautovic (Stoke City) right footed shot from outside the box is high and wide to the right following a set piece situation. Rickie Lambert (West Bromwich Albion) is shown the yellow card for a bad foul. Foul by Rickie Lambert (West Bromwich Albion). Offside, Stoke City. Jack Butland tries a through ball, but Marko Arnautovic is caught offside. Attempt missed. Cristian Gamboa (West Bromwich Albion) right footed shot from outside the box is high and wide to the right. Gareth McAuley (West Bromwich Albion) is shown the yellow card for a bad foul. Attempt blocked. Geoff Cameron (Stoke City) left footed shot from outside the box is blocked. Assisted by Marko Arnautovic. Substitution, Stoke City. Stephen Ireland replaces Mame Biram Diouf. Attempt missed. Callum McManaman (West Bromwich Albion) right footed shot from the left side of the box misses to the right. Assisted by James Morrison. Attempt blocked. Rickie Lambert (West Bromwich Albion) right footed shot from outside the box is blocked. Assisted by James Morrison. Attempt saved. James Morrison (West Bromwich Albion) right footed shot from outside the box is saved in the centre of the goal. Assisted by Callum McManaman. Attempt saved. Marko Arnautovic (Stoke City) right footed shot from outside the box is saved in the bottom right corner. Assisted by Geoff Cameron. Attempt saved. Erik Pieters (Stoke City) left footed shot from outside the box is saved in the centre of the goal. Assisted by Glenn Whelan. Corner, Stoke City. Conceded by Jonas Olsson. Corner, Stoke City. Conceded by Craig Dawson. Cristian Gamboa (West Bromwich Albion) is shown the yellow card for a bad foul. Marco Van Ginkel (Stoke City) wins a free kick in the attacking half. Substitution, Stoke City. Marko Arnautovic replaces Xherdan Shaqiri. Attempt missed. James Morrison (West Bromwich Albion) right footed shot from outside the box is too high. Assisted by Callum McManaman following a set piece situation. Cristian Gamboa (West Bromwich Albion) wins a free kick on the right wing. Offside, West Bromwich Albion. James Morrison tries a through ball, but Cristian Gamboa is caught offside. Substitution, West Bromwich Albion. Cristian Gamboa replaces James McClean.